It’s the silly season as UK supermarkets do battle over Champagne prices this Christmas. The marketing directors of many of the Grandes Marques must be hopping mad, as Morrisons have been selling Moët at just over £14 and Bollinger at £17.95. It’s 43 euros in our local caviste near Bordeaux (right). Several wine and money-saving sites have been keeping tabs on the best deals. Decanter’s website covers both the UK supermarkets and the High Street, while moneysavingexpert.com can be relied upon to chisel out the savings in times like this. The independents have been less than impressed with some of the more spurious claims of 50% off, and they’re right to expose any deliberate attempts to con the consumer. Or should we just grit our teeth and rise above it? 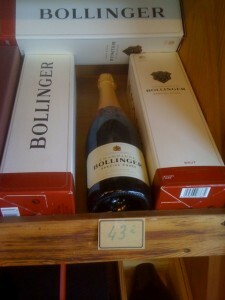 Morrisons selling Bollinger at £17.95 – did anyone get any at that price? One local store had sold out almost immediately! Let's move to another supermarket with a similar offer advertised nationally. Visiting their nearest branch, they had none left. Why? They were allocated only one case (small print said that not all stores would stick it!). So where had that gone? Into the manager's carboot, that's where!!!! But, yes, they had had some at that price! I saw saw the Morrison's ad, I moved fast and, thanks to a very accommodating lady in the check out queue was able to come away with 6 bottles of Bolly at £17.85 a throw.So, well done Ken Morrison for breaking the log jam over Champagne prices which should have been much lower much sooner given the huge stocks overhanging the market. Majestic must be sick as the proverbial perroquet.